Xena is a 12 week old, RSB guide assistance pup-in-training. I’m teaching her basic obedience, toilet training and basic commands before she begins formal training from 18 months of age. When she has her coat on she’s working and is quite well behaved. Without her coat on she is a normal pup and loves to play fetch, roll around and do all the things that normal puppies do. Why did you decide to train a guide dog? I’m happy with where I am in life and with my career. I decided it was time to give something back to the community and wanted to do something meaningful. I looked at my options, and training a guide dog was in line with my love of dogs and with volunteering. Xena also has basically the same access rights as a working dog, so she is my 24/7 shadow, meaning I can have a dog and not leave it at home. The draw back will be having to give her back at 18 months of age. 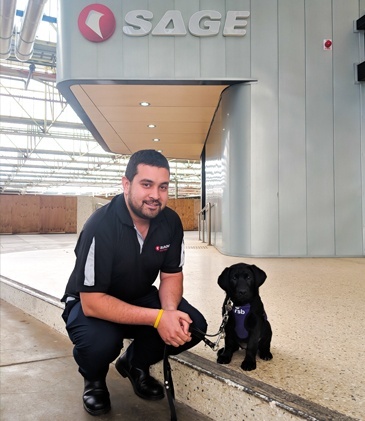 SAGE Logistics Supply Chain Analyst Mark Knoop says RSB pup-in-training 'Xena' has been well accepted in the SAGE workplace. How difficult is it to train a guide dog? It has its challenges. At the end of the day you are still dealing with a puppy, so it’s a challenge in the sense that you have to take her everywhere you go, which takes a lot of planning in order to have sufficient food and other supplies. At 12 weeks she is progressing pretty well and is already taking on basic commands. She is especially behaved during dinner times and is fairly calm when wearing her coat. When she’s in her coat, she knows that play time stops. How has SAGE made this idea possible, in the workplace? SAGE has been onboard from the beginning when I initially suggested training a guide dog. Obviously employees are not allowed to bring a normal dog to work, so there are certain unspoken guidelines – such as making sure Xena's not being disruptive and ensuring she is toilet trained, etc. But SAGE has been very supportive and considerate and Xena has been very well accepted in the workplace. I’m also employed casually, so Xena isn’t here every day. Would you recommend training a guide dog? If you have the time and patience and if you’re strict enough on yourself with guidelines. I certainly recommend it but just remember you have to give the dog back eventually.